Includes Administration costs, other social services as provided by case manager, and the cost of a site visit, if needed. Excludes SEVIS fee and Embassy fee. Students are eligible to enage in a paid internship, in their field of study, for one year. Students must have their internship pre-arranged in advance of visa issuance. 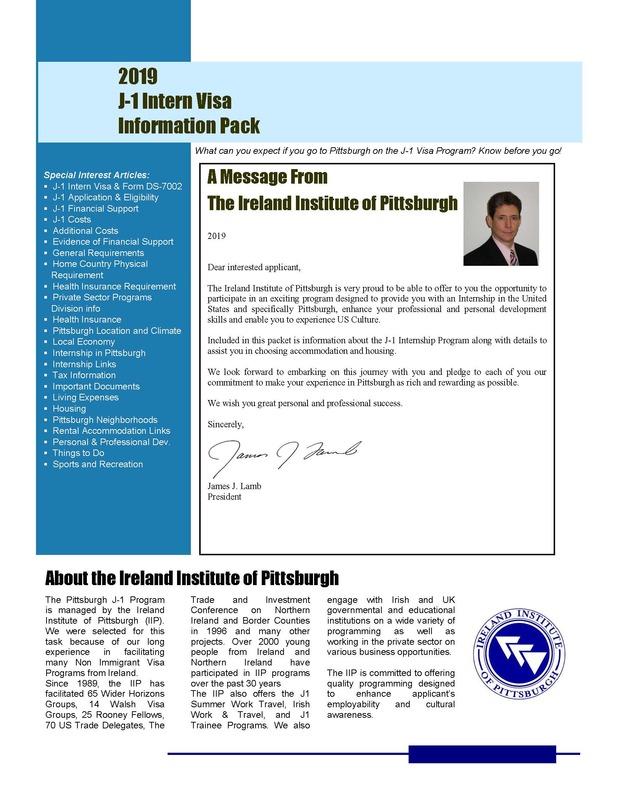 Please ensure you have read to J1 Intern information pack before proceeding. Click on image for download link. The Rules & Regulations form (download) must be signed, initialed where appropriate and dated – PDF (1 document, multiple pages). Training and Internship Placement Plan or T/IPP or DS-7002: has to be created and signed by yourself, your Internship supervisor, and ourselves, in advance of visa paperwork being issued. To create a DS-7002 document we need you to complete the TIPP Preparation Questionnaire J1 Intern (download) document. This document provides biographical information about the Internship position and Internship Site. It also outlines the content of the Internship program and the different phases associated with it. (Format: Word). The Notes on Training Plan has information on how the TIPP form must be completed. Each point must be strictly adhered to. We also need a copy of Intern provider’s Workman’s Compensation Document (Format: pdf) and a company brochure, if they have one (Format: pdf). Have the details ready of references: the name, address, phone number and relationship of two responsible adults – one personal and one professional. DS-2019 Issuance: Once we have approved your application, we will issue the DS-2019…this is the document you will take with you to the US Consulate/US Embassy in Northern Ireland or Dublin, etc. Once it is issued – you will be emailed with two sets of codes that can be then used to book your interview with the embassy/consulate. You don’t need to have the physical paperwork in hand to book the interview – but you must have it in hand to go to interview. So when booking you should schedule longer than one week. I’ll mail you the DS-2019 – it will take about a week to get there. If you want it by Fedex – we will pass this charge onto you.